Tribute to Allama Iqbal on his 74th death anniversary. A new blog for his spiritual mentor Maulana Jalal-ud-din Rumi (Rehmatullah Alaih). The Masnavi is a poetic collection of rambling anecdotes and stories derived from the Quran, Hadith sources, and everyday tales. 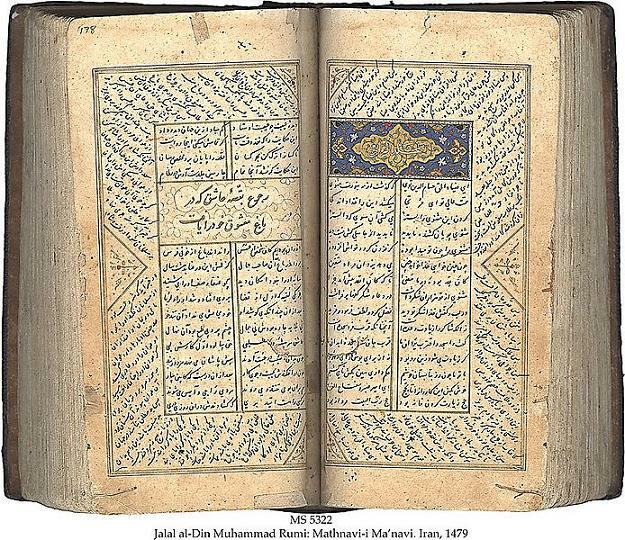 The Masnavi is a series of six books of poetry that amount to about 27,000 verses or 54,000 lines. The title Masnavi-Ma'navi means "Rhyming Couplets of Profound Spiritual Meaning." 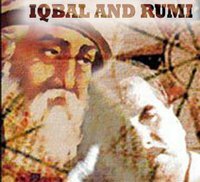 It is advice of Allama Iqbal to make Rumi (R.A.) your companion in the path of seeking truth. Here is this advice from Books Javed Nama and Asrar-e-Khudi. Allama Iqbal said he had read the Masnavi 10 times, Well Iqbal was genius person really, All the sources of Allama Iqbal were spiritual, not western. 7. The Way of those on whom You have bestowed Your Grace , not (the way) of those who earned Your Anger , nor of those who went astray. Answer is simple. This criteria is set by the Owner of this universe who is The Creator of everything. brother sura e fateha mein maghzub aur zaalleen dependant nahi hain ek dusray pe bal ke independant hain yani ae Allah na toh hamein maghzub logon mein shumar kerna aur na he gumraah logon mein. aur maghzub se murad woh ahin jo beshak ek bar bhi maghzub huey. aqal mandd ko ishara kaafi hai. And JazakAllah for this post Sir! Jazak'Allah Faqar nice post, Auliahs work according to inspirations (Ilham) received from Allah. Everyone get inspirations from Allah but only believers and Auliahs recognize these inspirations. "Tesla engaged in reading many works, memorizing complete books, supposedly having a photographic memory. Tesla related in his autobiography that HE EXPERIENCED DETAILED MOMENTS OF INSPIRATION. During his early life, Tesla was stricken with illness time and time again. He suffered a peculiar affliction in which blinding flashes of light would appear before his eyes, often accompanied by VISIONS. Much of the time the visions were linked to a word or idea he might have come across, at other times they would provide the solution to a particular problem he had been encountering; just by hearing the name of an item, he would be able to envision it in realistic detail. Modern-day synesthetes report similar symptoms. Tesla would visualize an invention in his mind with extreme precision, including all dimensions, before moving to the construction stage; a technique sometimes known as picture thinking. He typically did not make drawings by hand, instead just conceiving all ideas with his mind. Tesla also often had flashbacks to events that had happened previously in his life; these began during his childhood..."
I posted above information because many of us (today's Muslims) don't believe on INSPIRATION (Ilham) and VISIONS of Auliahs. If a simple scientist can get inspirations from Allah for inventions then why not Auliahs? Would appriciate the timely " Tribute to Iqbal n` Rumi "
& understand. Many Thanks for the post, wish you best. My guess would be that something will happen (world events) that will compel patriot expat Pakistani to come back to Pakistan, among them will be a person who will lead Pakistan. A time will come in Pakistan when pent/shirt wearing expat Pakistani's will be leading prayers in Masajids. There is definitely a group of nationalist Pakistani youth (20-40 years old) residing outside of Pakistan who are educated and know Islam well enough that they are Muslim by choice. Allah knows best. If we read AQ Hasan's last few columns we can see that Hasan sb, in the end of the columns, says that he has hopes from Jamat-e-Islami and Imran. Kuch cheezon par parda para rehna behtar hota, Allah ke raaz Allah hi janay. Mein to Sufi Barkat Ali (r.a.) ki book se aik baat parh kar darr gya tha. Unhon ne kaha tha "Agar mein app logon ko Allah ke raaz bata doon to app foran agay bata do ge. Iss liye mein app ko har baat nahin bata sakta." recently jitnay bhi incidents ho rhy hein in sb sy hmain aik result mil rha hy k jin k dil main zara b Nifaaq hy wo expose ho rhy hein. Siachin k incident k baad hm ny bohat sy politicians k byaan sunay hein jo keh rhy hein k Pakistan ko Siachin chhor dena chahiay kyn k jaan ziada qeemti hy. Wo tu ye mashwara b dy rhy hein k India k sath trade ko increase kya jaey. Lekin afsoos sy kehna prrta hy k hmari Awaam ki ankhain phir bhi nhi khulti hein. Wo in munafiqoon ko hi apna leader samjh rhy hein. MahaAllah Bohat Mubarak for the New Blog ....May Allah(swt) Accept and give barakah ,and may their be Further Outflow ,distribution and propagation of Khair InshaAllah (ameen) ! "Siachin ka incident bhi hadsa nahi hay"
Agreed, it has 100% possibility that Siachen and bhoja air disaster is some covert operation of the USA. CIA aik bar jiss ilaqay may ghuss jati hay to wahan pay ajeeb wa ghareeb waqiat ronmaa hotay hain. Apart from considering weather weapon or HAARP, it is possible for USA, with conventional weapon i.e a missile hitting a civilian aircraft from above a high altitude drone or some stealth aircraft in the presence of heavy rain and thunderstorm no one can trace a missile from a high altitude stealth spy plane. I think its a conspiracy theory. Our CAA and others departments are corrupt. So these kind of incidents take place. I think we have to look into our system , processes etc. Not blame to outsider's always. Jazaaq ALLAH for this post.The so-called 'enlightened' breed of Muslims have learned whirl dances from Jalal-ud-din Rumi's legacy but the truth is something else as highlighted in this post. It clarifies everything very well! - Regards - Roman Ahsan. First of all Faqar sahab, you are doing great and thanks for all of your efforts. I was reading the previous thread where Baktar-Noor sahab mentioned that Abdul Wahab sahab of tabhleeghi jamat sent messages to all of the elders to pray istaghfaar. I would like to know more about that , what would be the reason behind it, did abdul wahab sahab came to know something regarding pakistan and future? what are the talks going around with tabghleeghi people? P.S. Please congratulate me as I just have Allah's blessing in the form of a baby girl. Congratulations, Allah has blessed you with 'Rehmat', May Allah bless her with health, success and all the happiness of world, Daughters are coolness of eyes for their parents. Bohat Mubarik !! Allah humari gurya ko aap sab kay leay baais e khair o barkat banae aur ussay aik momina saleha banae, Allah ussay humesha humesha apni bey karaan rehmat ki chhaon main rakhay. Ameen sum ameen. Thanks both of you and your wishes. I have two daughters now (first one is two years old) and the hadis of Hazrat Muhammad Mustafa(Sallala-hu-Alai-he-Wasslam) came in mind occasionally that if a person have two daughters and he grow them up , give them good tarbiat and education and marry them to good places, he and me will be together in jannat. "In Pakistan the most corrupt men are the judges of the supreme court and high courts including chief justice who is wasting the priceless time of the nation in only extending of dates in the corruption cases of the ruling devils,since last 3 or 4 years. After the completion of the government tenure, these corrupt devils will fly to their original masters e.g USA,England or some other western country.Every one know that the government is doing corruption in every matter but due to this lazy and useless judiciary no one is punished or sent to prison.Army chief and chief Justice is only actors in the drama played by the corrupt system. They are doing their acts according to their roll in this evil drama. they all are the same kind of people." country which is contradictory to the islamic law or Quran and Hadith.Now what this corrupt judiciary did for rule of law in pakistan since last couple of years? is it islamic verdict to a criminal? or at least it has some sort of justice? every one know it well. People wake up hum ney ghalat logon se tawaqaat wabasta kiay hain. ye west se maroob sooted booted kalay angrez hamaray liay kuch bhe acha nahi kar saktay. ye log ya to apnay nafas ke ghulam hain ya power ke poojha kartay hain.